Another day, another attack from people who claim that they're anti-fascist (ANTIFA). A small crowd of about 100-200 activists gathered at the Washington D.C. May Day Strike/Protest/Rally/Whatever-you-want-to-call-it in order to raise awareness for not only workers rights around the globe, but for Socialism and Communism as well. 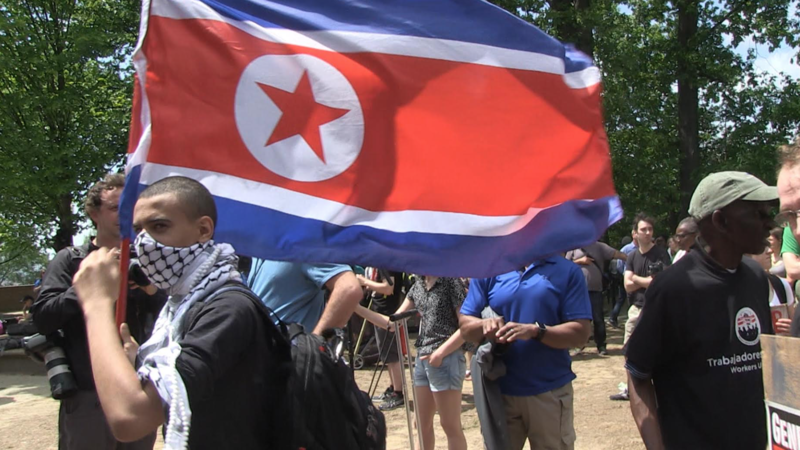 Rebel Media's Washington D.C. Bureau Chief Jack Posobiec simply asked an activist waving the Communist-ruled Republic of North Korea, why they would do so. Well, that didn't sit well with some at the rally, because not long after Posobiec asked the question one man decided to open palm strike the camera Posobiec was holding. Posobiec then took the man to the ground in order to defend himself, and that is when a few of the surrounding Communists began punching and kicking Posobiec in the back. One person holding the North Korean flag attempted to hit Posobiec in the head. 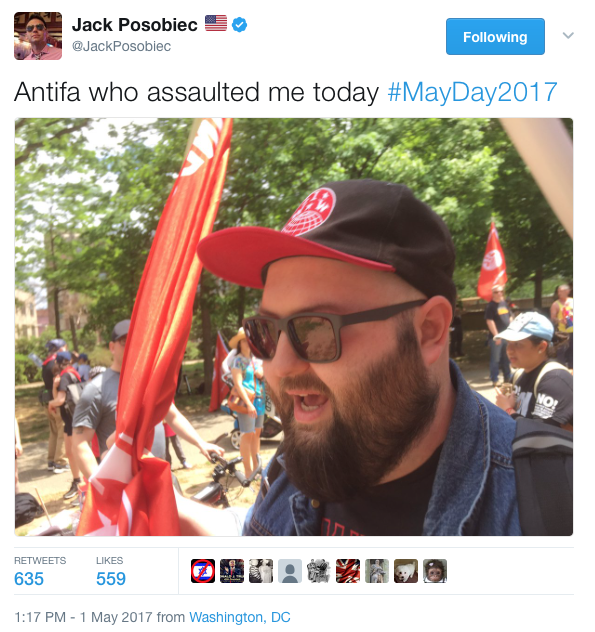 Another man, who Posobiec identified as activist Andrew Batcher, kept hitting Posobiec with his Communist flag. Ironically, Batcher at one point was a member of a group known as Nonviolence International. Go figure. Posobiec was then able to get away despite multiple flag holding Socialists following him and draping him in union flags, Socialist flags and Communist flags. It was clearly evident that freedom of speech and of the press were not accepted at this rally unless that speech or press fell in line with their radical ideology. Both Posobiec and MRCTV's Nick Kangadis were not allowed to even enter into a conversation with the people attending the event. At one point, Posobiec and Kangadis had bubbles blown in their faces while being called "Nazis." In an attempt to appeal to the activists self-promoted humanity, Posobiec asked the girl using a bubble gun to blow bubbles in our faces, "What if I was allergic to the bubbles?" "I don't care," said the ever-so compassionate Communist bubble blower. They didn't know us. They didn't know what our beliefs were. They simply didn't care about an open dialogue of ideas. All it took was an innocent question about why someone in America would carry a North Korean flag, and that was simply too much to handle for the Communists. 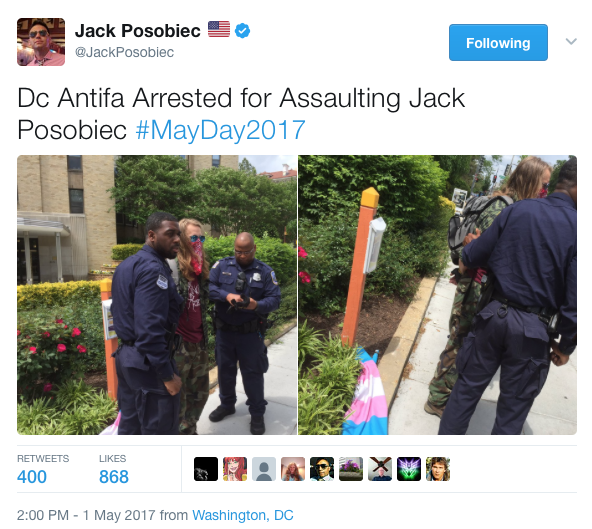 There was a small amount of justice when one of the men, who called himself "non-binary" and who assaulted Posobiec, was arrested by D.C. police for assault. MRCTV caught up with Posobiec moments after the altercation and talked to him about the situation that occurred.